1 envelope or packet of Active Dry Yeast, Instant Yeast, Rapid Rise Yeast, Fast Rising Yeast or Bread Machine Yeast weighs 1/4 ounce or 7 grams which equals 2 1/4 teaspoons (11 mL). If a recipe calls for 1 envelope (or packet) of Active Dry Yeast, Instant Yeast, Rapid Rise Yeast, Fast Rising Yeast or Bread Machine Yeast, then you would use 0.6 ounce Fresh Compressed/Cake Yeast. 2 ounces of Fresh Compressed/Cake Yeast equals a strip of 3 envelopes or packets (21 grams total), or 6 3/4 teaspoons approximately of Active Dry Yeast or Instant Yeast. Compressed/Cake Yeast only has a shelf life of 4 to 6 weeks. It is highly perishable. The "sell by" date on the package is the "expiration date" also. In the United States you can usually find Compressed/Cake Yeast in most large supermarkets in or near the dairy section of the store. It usually is packaged in 0.6 ounce cubes wrapped in silver foil. The most common brand found in supermarkets is Fleischmann's Yeast. It will be kept refrigerated. When you buy Compressed/Cake Yeast, take it home and refrigerate it right away, and use it by the "Sell By" date on the package. Compressed/Cake Yeast is highly perishable. Even though you don't need it when making bread, a little sugar can bring out flavor, just as salt can. For added moisture, try honey, maple syrup or regular or dark unsulphured molasses. It is not unusual for one-half or one-third of a loaf of bread to go uneaten at a meal. When you reach for the leftover the next day, you find that it has begun to go stale. Revive stale bread by placing it inside a brown paper bag, seal the bag, and moisten a portion of the outside of the bag with water. After placing it in a preheated 350-degree oven for about five minutes, the bread will emerge warm and soft. Most of my breads are made with all-purpose flour. Bread flour can also be used instead of all-purpose flour in most recipes. Most bread recipes call for shaping bread into a loaf and baking in a loaf pan. However, bread can be shaped into any shape and baked in almost any pan, just adjust your baking time as needed. Bread rises best in a moist, warm enviorment. 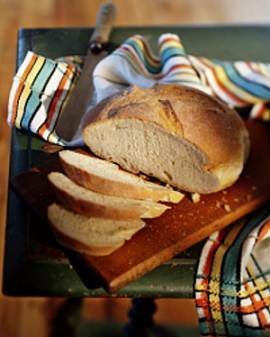 For a perfect place to raise bread, place bread in a microwave oven or regular oven with a pan of steaming water. Do not turn oven on, but close the door. All of my yeast bread recipes are made using the dough hooks on medium high speed, or speed #6 on some mixers. When yeast is dissolved in warm water, the water temperature should be 105 degrees F to 115 degrees F. This is usually very warm tap water. If a thermometer isn't available, run hot water over your wrist. It should feel very warm, but not uncomfortably hot. Do not increase or decrease the amount of salt. Salt helps strengthen gluten, which gives bread texture. Too much salt, however, can affect how well the yeast works. The more you know about yeast, the more you can appreciate the joys of working with it. Many bakers are unconditionally loyal to a particular format or brand. In professional circles, consistency is very important so yeast is chosen carefully. At home, we need a yeast which suits most of our baking needs. But where to start? Your grandmother probably used fresh yeast. Purists adore it. Doughs made with it are supple and bouncy and the yeast fragrance is subtle. Fresh yeast, usually the choice of professional bakeries, is best for doughs which will not undergo excessive handling. The strains used to make fresh yeast are different from those used to make dry yeast. Dry strains are selected for their stability under stress (drying, rehydration, poor handling). Dry yeast contains 5% to 8% moisture compared to 70% to 72% in fresh. After re-hydration (adding water to proof) or mixing with other ingredients, there is a "lag phase" which the dry yeast requires in order to become active again. Fresh yeast, of course, has no lag phase. Fresh Yeast does have its drawbacks. It is far less stable a product than dry. Fresh yeast in compressed form or in "cream" form is delivered every other day to the commercial baker - sometimes by the tanker truck load. Home bakers must rely on a professional baker to obtain fresh yeast or purchase compressed yeast in the dairy case (whenever it's available). Since fresh yeast does not require proffing, it's difficult to tell if it's truly fresh. Fresh yeast keeps for 10 to 20 days. If you buy a one pound block (which is what I do, although some bakeries will sell you half a pound) you may wish to freeze it. To do this, wrap it well in waxed paper then in plastic wrap and seal. It is important to keep the yeast from drying. Allow the yeast to defrost gradually in the refrigerator the night before you are planning to use it. The longer the yeast is frozen, the more it will lose potency. When in doubt, discard. In the United States you can usually find Compressed/Cake Yeast in most large supermarkets in or near the dairy section of the store. The most common brand found in supermarkets is Fleischmann's Yeast. It is usually packaged in 0.6 ounce cubes wrapped in silver foil. It will be kept in the refrigerated section. When you buy Compressed/Cake Yeast, take it home and refrigerate it right away, and use it by the "Sell By" date on the package. Compressed/Cake Yeast is highly perishable. Most cookbooks still call for "active dry yeast". Bakers who honed their skills with this yeast, know what to expect from it. "Active dry" is being replaced by "instant yeast". When "active dry" is called for, you may substitute "instant" if you like (see the substitution guide). As with fresh yeast, active dry is a live culture - with one notable exception. Under most circumstances, it must be proofed or reconstituted with water and a bit of sugar before use. Once it is exposed to air and moisture, it starts to lose its potency. A container of active dry yeast should be well sealed and refrigerated or frozen. Always take note of the expiration date. Also known as: "Fast Rising", "Rapid Rise" or "Bread Machine Yeast": Instant yeast is very active and very tolerant. It offers the baker a wide margin for error or experimentation. It activates rapidly in warm water and can be added to other ingredients in its dry state. It's a good keeper - 3 to 4 months in the freezer. Instant yeast is a good choice for rich coffee cakes and sweet breads which you may wish to freeze and for doughs which will see a slow rise in the refrigerator. Instant yeast's qualities become liabilities when you use too much of it. How do you know if this is the case? A premature rise and an overt yeasty, "beery" odor. Problems also arise when you allow a dough to proof too long. Make sure you do not allow doughs to rise beyond double their original size - 60% to 70% is fine. You can always opt for more fermentation in the final rise. Over-fermented doughs reduce the shelf life of the final product. The solution is very simple: less is more. Decrease the yeast portion by 15% to 25% increments. You can use too little yeast, but you won't compromise taste and structure if you let it rise (albeit) slowly. This may not work, however, with rich or heavy breads (i.e. rye) which need good fermentation power and mixtures which contain perishables. No two bakers, or kitchens, or ovens, are alike. Don't be afraid to do some tweaking. Instant yeast is the same type of yeast as "Rapid Rise" Yeast or "Bread Machine" Yeast. Instant yeast is packaged for commerical use and Rapid Rise or Bread Machine Yeast is packaged for household use. 1 envelope (or packet) of Active Dry Yeast, Instant Yeast, Rapid Rise Yeast, Fast Rising Yeast or Bread Machine Yeast weighs 7 grams, or 1/4 ounce and equals 2 1/4 teaspoons (11 mL). This Scottish quick bread is said to have taken its name from the Stone of Destiny (or Scone), the place where Scottish kings were once crowned. The original triangular-shaped scone was made with oats and griddle-baked. Today's versions are more often flour-based and baked in the oven. They come in various shapes including triangles, rounds, squares and diamonds. Scones can be savory or sweet and are usually eaten for breakfast or tea. 1. In America, biscuits refer to small quick breads, which often use leaveners like baking powder or baking soda. Biscuits are generally savory (but can be sweet), and the texture should be tender and light. 2. In the British Isles, the term "biscuit" usually refers to a flat, thin cookie or cracker. 3. The word biscuit comes from the French bis cuit ("twice cooked"), which is what the original sea biscuits aboard ship had to be in order to remain crisp.